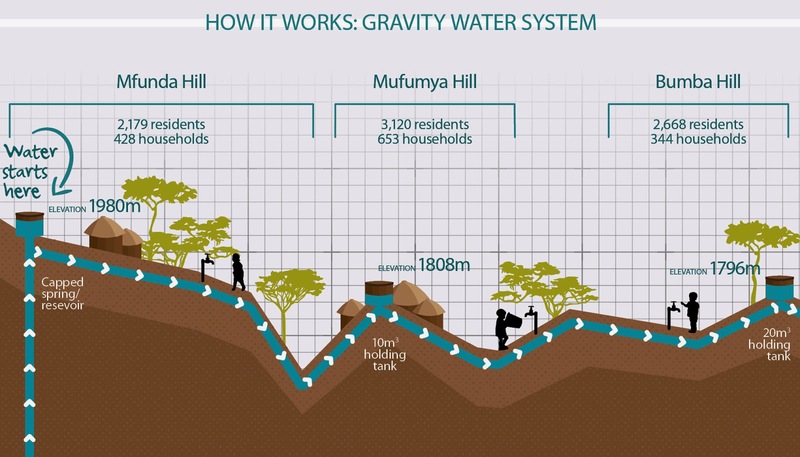 When the spring was discovered in the Mufumya area, it presented an ideal situation for a Gravity Water System. The natural force of gravity does all the work. The crystal clear water bubbling at nearly 2000m above sea level is captured at the source and protected from contamination in an initial tank or reservoir. Buried pipe then carries and collects the water to other holding tanks. The built-up pressure is more than enough to take the water from one tank to the next, providing a steady flow from the various taps along the way. Specially trained community volunteers have formed a water management committee to monitor and maintain the system. No electricity, no motorized pumps, And that's how it works!